John Schwarz has served as the visual assistant with the Spartan Marching Band since 1999. 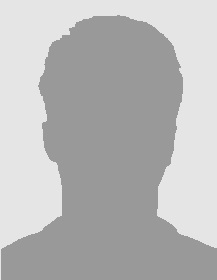 He was a member of the Spartan Band from 1994-1998 as a trumpet player. During that time, Schwarz was a squad leader for three years, and in his final year was the trumpet section leader. He was selected by his peers as the band vice president and also played trumpet in Spartan Brass. 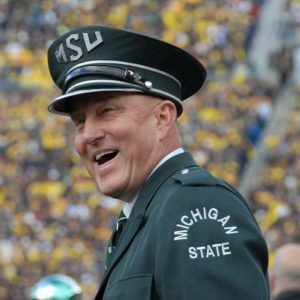 Schwarz has worked for Michigan State University since 2002. He is currently the hardware/software coordinator for the Institute for Public Policy and Social Research in the College of Social Science. He has a pair of bachelor of arts degrees from MSU, one in criminal justice in 1999 and the other in telecommunications in 2002. Glen Brough has served as the visual coordinator for the Spartan Marching Band since 1988. As a former member of the ensemble, he is one of seven SMB drum majors to have held the position for four years. Brough is assistant director of admissions at MSU, and in 2013, was awarded the university’s prestigious Jack Breslin Distinguished Staff Award. 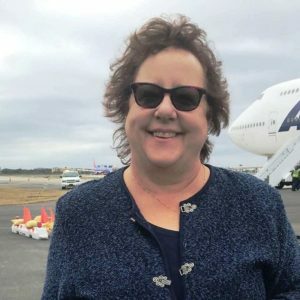 In addition to attending MSU as an undergraduate, Brough earned a masters degree in higher education administration from Michigan State in 1986. Brough is a member of the board of directors of the Phantom Regiment Drum & Bugle Corps, where he has also served as a visual instructor. 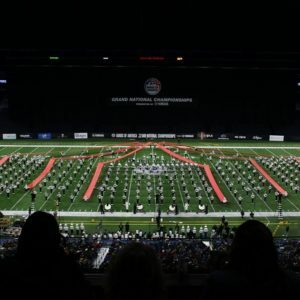 As a drill designer, he has written 100+ field shows for numerous Michigan high school bands. 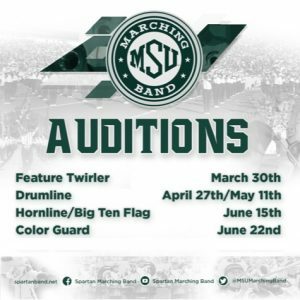 Brough coordinated the MSU Performing Arts Camp for over 30 years and taught drum majors nationwide for nearly four decades. Jon Weber is instructor of percussion at the Michigan State University College of Music, where he teaches applied percussion lessons, percussion ensemble, salsa band, and the award-winning Michigan State Drumline. The MSU Percussion Ensemble, with Weber as co-director, was selected to perform at the 2013 Percussive Arts Society International Convention. He has presented clinics throughout the United States, and in the summer of 2012 presented clinics and a recital in Colombia. Weber has also presented clinics at the Collegiate Band Directors National Association Symposium, Yamaha Sounds of Summer Program, and served as a panel clinician at the Percussive Arts Society International Convention multiple times. Weber has performed with the Grand Rapids Symphony Orchestra, the Lansing Symphony Orchestra, the Brass Band of Battle Creek, the Flint Symphony Orchestra, the Saginaw Bay Symphony Orchestra, the New York Solsti Orchestra and the Santa Clara Vanguard. He has performed as a percussionist with various world fusion bands over the years. In 2009, he founded the Michigan State University salsa band, Salsa Verde, which performs in Michigan; he still directs and performs in this ensemble. He currently plays drumset with the Michigan salsa band Orquesta Ritmo. Weber assisted in the MSU Study Abroad Program in Cuba in May 2015, both teaching and performing with the enrolled musicians in Havana. He taught the Michigan All-State percussion program at Interlochen from 2007-2009. He has also taught percussion and the drumline at Oklahoma State University. He has performed Michael Daugherty’s timpani concerto Raise the Roof with the MSU Wind Symphony and Bartok’s Sonata for Two Pianos and Percussion with Orchestra with the MSU Symphony Orchestra. 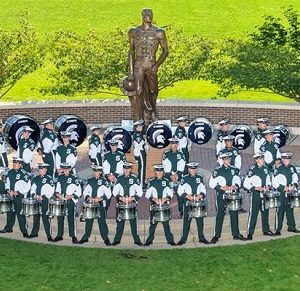 Weber heads the percussion faculty for the summer Performing Arts Camp at Michigan State University. 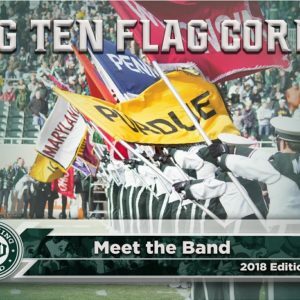 With the MSU Drumline, he has presented performances at the Bands of America Grand National Championships, the Percussive Arts Society International Convention, and wherever the Spartans play football, including the Rose Bowl in 2014. Weber has published his pieces X and Machine (winner of the 2013 PAS Percussion Composition Contest) with Tapspace Percussion. From 2004-2011, Weber was composer / arranger for the Detroit Pistons Drumline, which has performed at NBA games in Detroit and Chicago, with Kid Rock on Jimmy Kimmel Live! and the 2006 NBA All-Star Game in Houston, Texas. University and NBA Drumlines have performed his percussion arrangements throughout the United States. In 2013-2014 he arranged the front ensemble music for NorthCoast Academy of WGI. Weber received his DMA in percussion performance from Michigan State in 2008. He is a Yamaha Performing Artist, Tapspace Artist, and member of the Vic Firth Education Team. 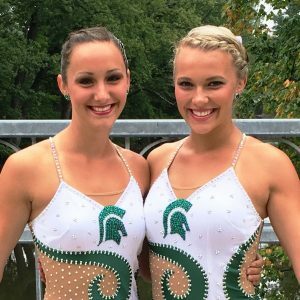 Emily marched with MSU’s Winterguard, State of Art, for three years and was selected as Flag Captain for her final year. 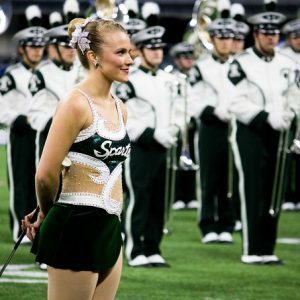 As a member of the Spartan Marching Band from 2011-2015, she served as a squad leader for three years and baritone section leader her final year. Emily was voted band vice-president in 2015. Emily participated in individual flag competitions for the Michigan Colorguard Circuit from 2005-2011, earning one bronze, one silver, and three gold medals. During the summers of 2011-2015, she was also an instructor at Smith-Walbridge Drum Major Clinics in Illinois. Rogers does project management for the Michigan Health Information Network Shared Services (MiHIN). Emily has a bachelor’s degree from MSU in Interdisciplinary Studies with a focus on health and society.